Dear Revelation TV Viewers Since Revelation television began nearly sixteen years ago now, I cannot remember Revelation ever having sent out a letter like this one asking for help with finances. So this is a first for us! ITV LONDON STUDIOS CLOSE FOR REDEVELOPMENT About a month ago, it was brought to Revelation TVs attention, that the ITV studios on the South Bank in London, were closing and the building being demolished. Most of the expensive equipment in the premises was being sold off. Not expecting much, Howard (Conder) and I went for a guided tour of the premises. We were shocked by what we saw. 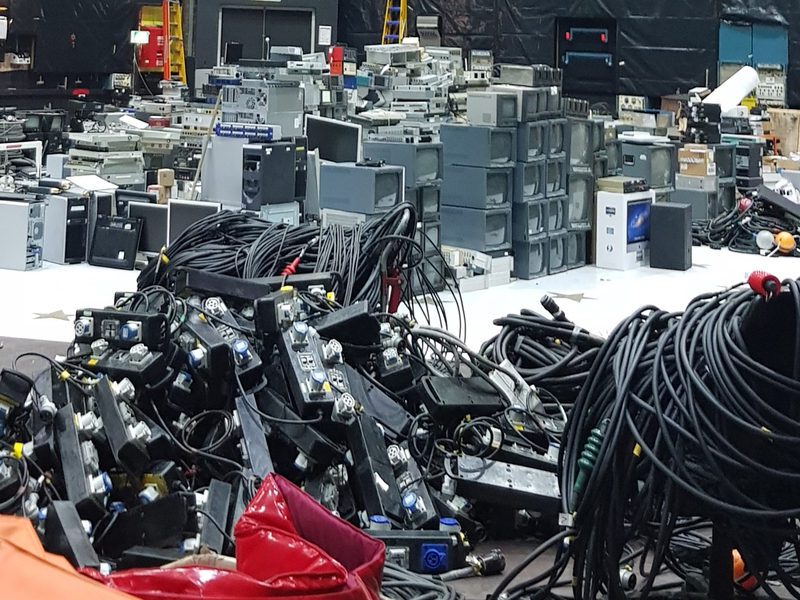 It was full of the most expensive equipment you could imagine, used for top ITV entertainment shows such as Ant and Dec, Blind Date, Loose Women  such quality, and quantity in cameras, Vision Mixers, sound desks and all the other equipment that is needed to make a studio work. A few days later, Howard and a professional from the TV industry, returned to the ITV studios to make a wish list of what we could use in our new International Centre. I can tell you it was some wish list by the time it was finished! If we were buying the items on the wish list new today, they would cost somewhere between three and four million pounds. Even being sold off as discarded items, we were told if we wanted them, the price would be over £600,000. Somehow, through help from professionals in the industry, good negotiating skills, and we would say - the favour of God - the price came down to £234,000. DECISION TIME We had to make an instant decision. If we did not buy the items on our wish list, others were clamouring to do so. At some point in the next twelve months, we knew we would need to buy all the items, though we would not buy such good quality. So we said yes to purchasing the items, and paid the 25% deposit that was required immediately. We had the £58,500 needed for the deposit, in the reserve funds for the Revelation International Centre. REASON FOR THIS SPECIAL APPEAL The reason we are writing to you now, is that we have to pay the remainder of the money  £175,500 by the 17th September 2018. The items will be kept in the UK until November and then delivered to us in Spain, by four articulated lorries. Yes, there is that much! The September 17th deadline for payment is not our date. It is set by the Company selling the equipment to us. CAN YOU HELP US? We know that so many have given extra-ordinarily generously to the building fund over the last few years. Maybe if you are thinking of giving again in the future you might bring your gift forward to help us with the time frame we have to pay for the equipment. SEPTEMBER 17th 2018 WILL COME QUICKLY! The date is so near. For the first time we are sending out a letter such as this to make our needs known. We will also explain further and invite telephone donations, during the live Time for Revelation programme on Wednesday evening, 5th September, at 9.00 pm on Revelation TV, and repeated on Thursday 6th, and Saturday 8th September. A STEP OF FAITH Many of you have just read the George Muller story. He was a man of God who stepped out in faith to do the will of God. We have done the same with this equipment. Please will you help us to complete the payment - in full - and on time - by September 17th 2018. Thank you for standing with us. We run with patience the race that is set before us. Warmest greetings, Gordon Pettie, (CEO) On behalf of all the Revelation TV leadership and trustees.